Silver Lake is an architecturally and culturally rich place in Los Angeles. You’ll find a huge number of musicians, artists and writers living and working there. The views of mountains and skylines attract Hollywood filmmakers. In 1930, Walt Disney built his first studio in the Silver Lake area. It was followed by Talmadge (ABC), Mack Sennett Studios, and Monogram (KCET). Modernist architects construct new homes with all modern facilities and techniques on a budget. They raised the bar of real estate dealing in the country. Culture is very vibrant and alive in this area. People living in neighboring areas prefer Silver Lake as their destination for drinking, fine dining, and nightlife. Let’s start off with some popular bars and lounges in Silver Lake. 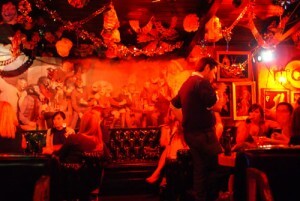 Cha Cha Lounge is a small dive bar in Silver Lake, featuring reasonably priced libations and a psychedelic tiki lounge meets Dia de los Muertos theme that must be experienced to be believed. This favorite neighborhood hangout is frequented by hipsters, and college students alike. Nights spent here as as diverse as the clientele, as music varies from disco to gangsta rap. Come for the music and the PBR, stay for the interior red lighting that makes everybody look more attractive. Red Lion Tavern is the oldest operational German tavern in Los Angeles, complete with a live pianist and a beautiful outdoor beer garden. During the day, locals enjoy traditional German cuisine, such as bratwurst and beef rouladen. At night, you will see youngsters all around laughing and drinking. This place is well known for their German beer and sausage platters. Don’t forget to order your beer in a traditional 1.5 liter boot! The Silver Lake Lounge is an amazing place to hang out in Silver Lake. This bar and music venue is a hidden gem where visitors can catch an eclectic mix of up and coming local bands. Several acts maintain residencies, and live bands play Monday through Thursday. This bar also features excellent happy hour specials on beer, well drinks, and specialty beverages. This is surely a destination for the music lover looking to discover new bands to follow. If you are convinced Silver Lake in Los Angeles is a great place to live, call a Silver Lake real estate agent or Los Angeles real estate agent at 213 375 8738, or contact us online. Los Angeles Real Estate Unlimited can make your life even better.